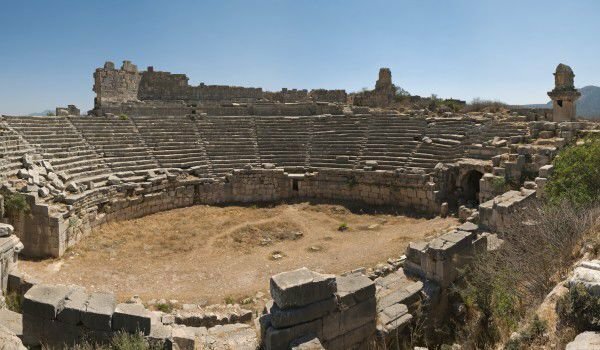 Xanthos is an ancient city which is located in Turkish areas of Mugla and Antalya. It is a unique archaeological complex, holding the remains of the ancient capital of Lycia. It is the largest city in the kingdom Myra from the 8th century BC, but this territory was inhabited during the Bronze Age and during the first centuries of the Iron Age. Since 1988 Xanthos is listed as a UNESCO World Heritage Site. The original name of the ancient city is Arñna, which is transformed into Arinna and only the Romans gave the settlement the name Xanthos. Today's ruins are a successor of the former cultural and commercial capital of ancient Lycia, which for centuries has been conquered and flourished under the rule of Persians, Macedonians, Greeks and Romans. Data on the wealth and prosperity of Xanthos comes from the notes of many Greek and Roman authors. Strabo describes the capital of Lycia as the biggest and most diverse settlement of this ancient nation. Over 540 years BC Xanthos was conquered by Harpagus and the Persian Empire, these events are described by Herodotus, and Appian. The battle took place on the plain north of the city, the Myra army had no real chance against the numerous Persian. After the defeat in the battle, they retired in Xanthos, which continued to be besieged by the Persian soldiers. Herodotus tells how locals destroyed their own Xanthos Acropolis, continued with the killing of female children, and slaves and embarked on a suicide attack against the army of Harpagus. Thus, all Lyceans were killed, but 80 families survived because they were in Xanthos at that time. Further, under Persian control Xanthos was booming again. Evidence of this comes from the many buildings built and the architectural achievements, especially tombs, culminating in the Nereid Monument. This is a very beautiful, large tomb complex erected about 380 BC in a mixed Greek- Myran style. More interesting is a place called Lion's tomb. For a time Alexander the Great ruled Xanthos, then the city was destroyed, rebuilt and destroyed again. At the time of Mark Antony Xanthos again enjoys sunny days. From this period a Roman amphitheater is still preserved. Xanthos was actually excavated and looted by the British in 1838. Much of the wealth and findings are currently in London's British Museum. Today in Xanthos can be seen the Harpy Tomb. It is dominated by a tall pillar, reaching 7.5 meters up. In its upper part is seen a marble Pillar Tomb, which is actually two graves on top of each other. This monument in Xanthos is slightly taller than the Harpy Tomb and is presumed to have been erected between 5 and 4 century BC.